I was very happy with the customer service provided by Danforth! Helpful and friendly people, the product ships fast and is even more beautiful in person. I highly recommend. This popular palladium twisty ring has a beautiful floral engraving and 14 round diamonds that range from .013 to .02 carats. You choose your center diamond from our inventory. 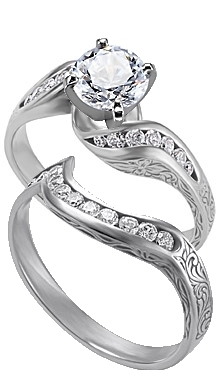 The engraved twisty band with 12 - .021 ct. round diamonds fits snuggly against the ring for an exquisite matched set.